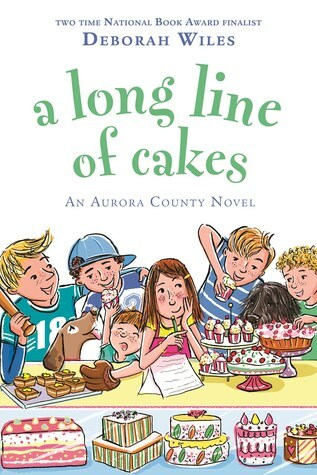 A Long Line of Cakes is the fourth book in the Aurora County series by Deborah Wiles. Picking up immediately where book three, The Aurora County All-Stars, left off, the story begins with the Cakes family arriving in town. They are itinerant cake bakers, so they never stay in one place too long, but as soon as she sets foot in their new home, Emma Lane Cake, one of the five Cake kids, wishes she could make Aurora County her permanent address. Knowing she can't, however, and feeling heavy with the sadness of having said goodbye to many best friends in the past, Emma hesitates about making yet another new friend she will have to leave behind. But when Emma meets Ruby Lavender, she decides to put herself out there just one more time. Soon, the two girls hatch a plan that might help Emma's parents change their minds about moving so often. I think of this author as Fannie Flagg for tweens. Each of the books of this series is so gentle, and the setting is so idyllic, that a reader can't help but feel a sense of cozy comfort when she is immersed in these stories. That said, for a fourth book of a series, published 11 long years after the third book, it assumes a lot of background knowledge on the part of the reader. I read the entire series for the first time in order to be ready for reading my ARC of this one, and it's a good thing I did. Had I not done so, I definitely would have been lost for much of the book. There are so many characters, and they share so many memories and traditions that the reader really can't appreciate the Cakes' love for Aurora County without understanding all of these details, most of which have been established by an earlier book and are only alluded to in this one. It felt like the book was trying both to tell a new story and to bring all of the previous stories to a satisfying conclusion at the same time, and it often felt like too big of a task. All that said, for fans of the series, or those willing to go back and read the earlier volumes, there is a lot to like about A Long Line of Cakes. Kids can relate to the importance of home and friendship and they will easily become invested in understanding Emma's father's long-forgotten connection to Aurora County. The way things are resolved is also very satisfying, especially for kids like I was, who crave uncomplicated happy endings and hate goodbyes. This was an okay read for me, and it definitely does not stand alone, but for the right child who has enjoyed the earlier books, it could become a favorite.